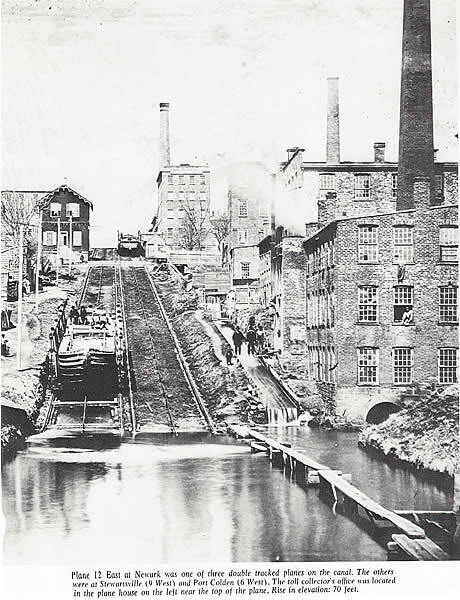 From "A History of the City of Newark"
The Morris Canal was a powerful factor in promoting Newark's prosperity and in stimulating street and road development. The agitation for its construction began in the early 1820's. In 1824 the Legislature authorized the building of the canal from the Delaware, near Easton, to the Passaic, near the present city of that name. The canal company was empowered to raise $1,000,000 in capital stock and to increase this by half a million, if this sum should be found necessary to complete the work. In 1828 the canal company was authorized to extend the canal to Jersey City. The enterprise was not fully financed until 1830, when a loan of $5,200,00 was assured from capitalists in Holland. This sum offered was more than five times that asked for. As a consequence, the canal stock immediately jumped to eighty-five points above par. The "ditch" was completed from the Delaware to Newark (the route as it approached this section having been diverted from the Acquackanonck region) in 1832, and immediately put in operation. The actual cost of the canal, from Phillipsburg to Newark, was about $2,000,000, instead of $817,000, as originally estimated. The first boat to reach tide waters was the Walk in the Water with a consignment to Stephens & Condit. This was on the 19th or 20th day of May, 1832.